You will be picked up by private chauffeured driven Executive Minivan and taken to Pearl Harbor where you are offered a cold drink of water or tropical juice before accompanied to the entrance of the Visitors Center. You will be met by our supervisor or our coordinator to give you a brief orientation and provide your prepaid vouchers & tickets. No waiting in long line for USS Arizona Memorial ticket. Feel the comfort as we take you to the most visited Pearl Harbor historic site. This Pearl Harbor private tour/transfer package also take you to a 2 hours Honolulu city tour from Honolulu historic down town to Makapuua point near sea life park. You will be picked up by our chauffeured style driven vehicle and taken to Pearl Harbor where you are offered a cold drink of water or tropical juice before accompanied to the entrance of the Visitors Center. You will be met by our supervisor dressed in black with a gold tie to give you a brief orientation and provide your vouchers & tickets. 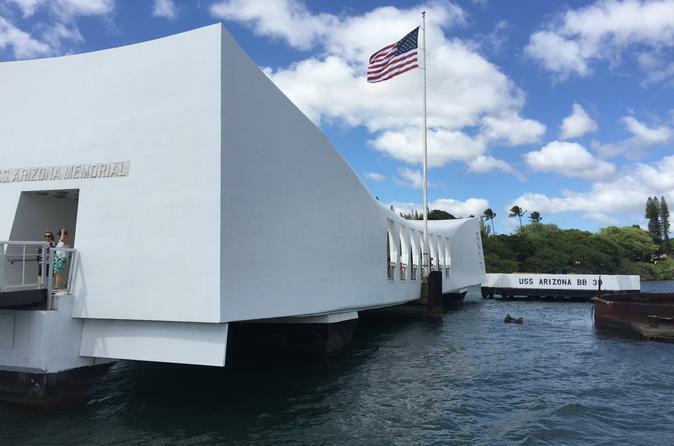 This self-directed Pearl Harbor tour/private transfer package includes USS Arizona Memorial tour and a *complimentary short city tour to some great places and structures in downtown Honolulu. Visit Pearl Harbor with us and enjoy a safe ride and VIP service with our private vehicle (all tours are based on our executive minivan). We are a trusted provider of luxury tours in Hawaii, offering VIP services at the most reasonable rates for comfortable and worry-free private tours. After your Pearl Harbor tour, our chauffeur will take you on a Honolulu city tour of Downtown Honolulu to show you the statue of King Kamehameha I and the renowned Iolani Palace.